Don't ever settle for ordinary fortune cookies again! 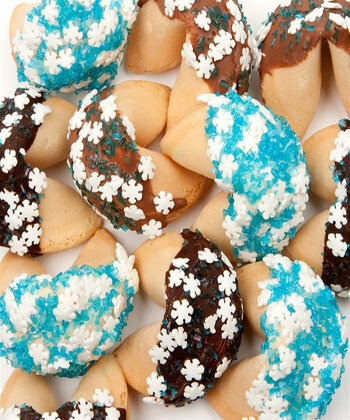 The only "traditional" thing you will find about Lady Fortunes Classic Gourmet Fortune Cookies is their size! Baked fresh in small batches each day each crisp vanilla fortune cookie is hand dipped in fine Belgian Chocolates- your choice of Dark, Milk or White-, or rich golden Caramel. Our Confectionary Artisans finish each cookie with a delicate shower of Frosty Sugars & Snowflake Sprinkles! Each delicious hand dipped cookie hold our Merry Messages inside- delightful messages for the Holiday Season. ( No Christmas Messages- rather Holiday General). Each cookie is meticulously wrapped in its own crystal-clear cellophane bag, and heat-sealed at both ends for freshness and quality. Go ahead and get some for your next dinner party as an unexpectedly clever and delicious dessert item...or indulge yourself and give your cookie jar a refreshing break from the ordinary! Choose an assortment of our most popular flavors OR stick with your favorite Belgian Chocolate dip!